The Jewish Temple was the holiest place in Israel. "Scholars who study the laws of the service are considered by Scripture as if the Beit Hamikdash (Temple) was built in their days" (Talmud). 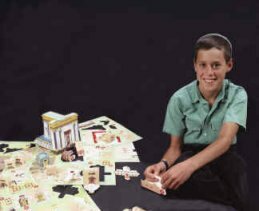 Read on to find out how you can learn about the Jewish Temple and have fun doing so. It's easy. It makes a great gift for young and old alike. The experience of building the Temple yourself will give you a solid and long-lasting understanding of its layout. The Mishna, the Babylonian Talmud and commentaries. Maimonides' Mishneh Torah and commentaries. "The Second Temple", Shalom Dov Steinberg, Ch. Wagshel Ltd., Jerusalem, 1993 (Hebrew). The Second Temple model on display at the Temple Institute exhibition in the old city of Jerusalem. "The Second Temple in its Splendor", Rabbi Elchanan Eybeshitz, The Rav Kook Institute, Jerusalem, 1995 (Hebrew). We are so sure that you will be thrilled with it that we offer you a 30-day money back quarantee. If you are not completely satisfied with the model kit, just let us know and we will give you a refund. For only $39.95 plus shipping and handling you can now have the model of the Temple in your home. Remember: If you're not absolutely satisfied for any reason you can return your Temple Model Kit for a full refund. Contact us for more information or to inquire about discounts for volume purchases.